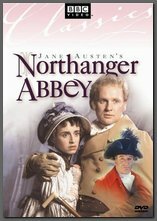 Even though Northanger Abbey has often been touted as the least popular of Jane Austen’s six major novels in readership and sales, I have long adored it for its burlesque humor and charming characterization of hero Henry Tilney. It has always been a puzzle to me why others did not bond with it, and felt it has never gotten a fair shake. The fact that the 1986 movie adaptation of it was really odd and not a true representation of the story or characters did not help matters either. So when PBS premiered the new Andrew Davies adaptation of Northanger Abbey (2007) last January on Masterpiece Classic, I was thrilled with the possibility that it could generate a new audience for my dark horse. When it aired, the reception was mixed by the public and critics. I was enchanted even though it was much too short at 90 minutes and unfortunately, much had been cut out of the story. On the positive side, it was energetic and great fun and Austen’s intensions were treated much more reverently than the previous effort in 1986, so it was step in the right direction. Ok, that made my day! Even after ten months, this story makes me smile. In a way that some objected to, the new Northanger Abbey movie did reach people in a positive way inspiring them to read Austen’s gentle parody and the Gothic fiction mentioned in the novel such as The Mysteries of Udolpho and the other ‘horrid novels’ listed in the Northanger Canon. One of my customers even quoted Henry Tilney’s great line about “The person, be it gentleman or lady, who has not pleasure in a good novel, must be intolerably stupid.” Talk about Gothically inspired! Now that gentle readers, made my entire year! In anticipation of the premiere on Sunday of the new adaptation of Jane Austen’s novel Northanger Abbey presented by PBS, I thought it helpful to introduce the hero Henry Tinley, and highlight some of his most insightful quotes and humorous passages from the novel. I believe that Jane Austen has created her most charming, quirky, clever, and well spoken male character of any of her heroes in Henry Tilney. In one of her few physical descriptions of her characters of any length, we are given more than a brief introduction. If by some happy chance, you are reading the novel or viewing the adaptation for the first time, you have quite a treat in store for yourself. Henry is the unique voice of reason and witty humor throughout the novel. When he speaks, it is usually in conversation with our heroine Catherine Morland, and he is all about winning her respect with bright and insightful little nuggets on life philosophy or personal opinion on a variety of topics! In fact, his decided views of love, marriage, dancing, history, politics and human nature make him quite possibly Jane Austen’s strongest male character, not only because we have no doubt of his mind, but the fact that he has absolutely no trouble expressing it. If you have previously read the novel, or seen the 1986 BBC adaptation staring Katharine Schlesinger as Catherine Morland and Peter Firth as Henry Tilney, you are well aware of his esteem-able nature and are quite possibly already a fan. He is hands down my favorite Jane Austen hero. Why? Many of Jane Austen’s heroes have fine qualities, but in my estimation, none reach the level of Henry. For who could not fall in love with a man of such “pleasing countenance” and “lively eye”; – – who dances quite well, is passionate about expressing himself with, alacrity, certitude and acumen, and happily rescues our heroine? Who indeed? Mark you calendars and set your watches for for the premiere of Jane Austen’s Northanger Abbey, presented by PBS, Sunday, January 20that 9:00 pm. Staring Felicity Jones as Gothic novel influenced Catherine Morland, and J.J. Feild as her hero, and ours, Henry Tilney. Watch out for the stellar performance by Carrie Mulligan as Catherine’s flip, hip mentor, Isabella Thorpe. You can read the review An Austen Heroine with a Fertile Imagination in the Los Angeles Times, and tune in to PBS for all the horrid and romantic escapades of our heroine in the making on Sunday, January 20th at 9:00 pm. 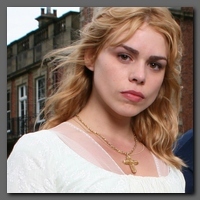 Read additional posts about characters and quotes in my Northanger Abbey blog archive, including my introduction to our heroine Catherine Morland entitled Northanger Abbey: Acquistion of Higher Delight. Check out my musing on that despot General Tilney at my other co-blog, Jane Austen Today, and round out the Northanger converage at Jane Austen’s World’s post on the likeable hero & heroine Catherine Morland & Henry Tilney. It’s official! In honor of the ‘opening night’ season premeire of Jane Austen’s Persuasion, Masterpiece Theatre Classic has revealed their bright and shiny, new interactive web site; – – and it’s ready for your perusal and enjoyment, full of all sorts of bells and whistles! Be prepared to be wowed, cuz it sure knocked my bonnet off! The front page sports a completely new design and displays The Complete Jane Austen series, opening with a slide show of photos of Persuasion, and access to a preview film clip. Each of the adaptations are accessible from this portal. Oh joy! You can explore each of the six adaptations: Persuasion, Northanger Abbey, Mansfield Park, Pride & Prejudice, Emma, Sense and Sensibility, and new biopic Miss Austen Regrets from the Classic Schedule. Dig deeper and discover the synopsis, cast & credits, cast interviews, characters, Jane Austen and resources for each production! Of particular amusement, is a special section devoted to The Men of Austen, where you can read match.com-like bios of each of the bachelors, learn “who is a dream, a bore or a scoundrel”, and then vote on your choice of the ideal Austen mate! Check the tallies to see how you rate against other Austen addicts. There is so much to see and explore that you can spend hours just cruising about, scouring the historical archives, peeking at the poster gallery, learning about educational resources, shopping at the store, and connecting to the community through the discussion boards that I will cut it short like Mr. Darcy and decree, “GO TO IT”! In Jane Austen’s 18th-century society, personal alliances fueled the social strata, connecting families in marriage, and in business. And so it continues today, as PBS reaches out to the Jane Austen community to promote its upcoming series The Complete Jane Austen, through its online guest blogger project Remotely Connected. Eight Austen enthusiasts and authorities from the online community have been invited to write about each of the upcoming Jane Austen adaptations and a new biography being presented by Masterpiece Classic, beginning Sunday, January 13th with Persuasion, and concluding in April with Sense & Sensibility. Uniting these eight unique Austen resources brings together a talented and diverse group of Janeites, who have created the most informative and lively web sites and blogs on the internet to honor and discuss their favorite author. Here is a list of the accomplished writers in order of their contribution to Remotely Connected, and their online entities. Victoire Sanborn (Ms. Place) of Jane Austen’s World: This blog brings Jane Austen and the Regency Period alive through food, dress, social customs, and other 19th-century historical details. Enjoy thoroughly researched and enlightening posts about everything from netting a reticule to Jane Austen’s timeless insights. Her other blog Jane Austen Today explores how we see Jane Austen today through movies, print, sequels, web sites and modern day media. 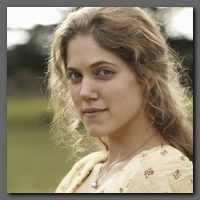 The talented and knowledgeable Ms. Place will be writing about Persuasion, which airs on Sunday, January 13, at 9:00 pm. Heather Laurence of Solitary Elegance: This web site is a collection of educational and research resources relating to Northanger Abbey, Jane Austen’s often overlooked and underrated work. It also prominently features a beautiful collection of watercolor illustrations from all of Jane Austen’s novels by the renowned artist, C.E. Brock. Heather also shares her unique sense of humor, Jane Austen passions, and family exploits on her clever Gimletblog, (more fun than a poke in the eye with a stick). The accomplished and elegant Heather will be writing about her favorite novel, Northanger Abbey, which airs on Sunday, January 20, at 9:00 pm. Lori Smith of Jane Austen Quote of the Day: This blog features daily wit and inspiration from Austen through quotes from her novels and letters, with such gems as “I cannot speak well enough to be unintelligible” and “Vanity working on a weak head, produces every sort of mischief.”. Lori is a freelance writer and recent author of the lovely and favorably reviewed book, A Walk with Jane Austen: A Journey into Adventure, Love and Faith. You can read the latest news about its release on her other blog, Following Austen. Lori’s sensitive and patience nature will serve her well when she writes about Mansfield Park, which airs on Sunday, January 27, at 9:00 pm. Laurel Ann Nattress of Austenprose: My blog is a daily celebration of the brilliance of Jane Austen’s writing, including passages and quotes from her novels and letters, and focusing on her ability to write of the society in 19th-century rural England with keen observation, irony and wit. Also featured are vintage and contemporary illustrations from her novels. I am a life-long Austen devotee who now augments my passion by introducing others to the delights of Miss Austen as a bookseller at Barnes & Noble. I also co-blog with Ms. Place at Jane Austen Today. I will be writing about the new biopic, Miss Austen Regrets, which airs on Sunday, February 3, at 9:00 pm. Jessica Emerson (Janefan) of Austen-tatious: A Jane Austen fan blog, “marked by, or fond of, conspicuous or vainglorious and sometimes pretentious display of all things related to Jane Austen“, that is always light, entertaining and filled with news and personal insights about movies, books, print media and news around the web concerning Jane Austen. Jessica is a professional writer in the communications industry and an avid reader. Visit her other blog, The Bookworms Hideout, for her perspective on current book publications and the classics. Jessica will be writing about the adaptation of Emma (1996), staring Kate Beckinsale & Mark Strong, which airs on Sunday, March 23, at 9:00 pm. Laurie Vera Rigler of A Great Deal of Conversation: The Blog & Forum: Calling all Austen addicts, be prepared to (almost) satisfy your obsession at Laurie’s beautiful web site and blog, featuring conversation (blog & forum), passions (links), many charming views (videos) and information about her latest book, The Confessions of a Jane Austen Addict. Laurie is a freelance book editor who teaches writing workshops, and is a popular guest blogger. Her vibrant comedic style and high energy will serve her well when she writes about Sense & Sensibility, one of Austen’s most moving and humorous novels, airing on two consecutive Sundays, March 30 & April 6, at 9:00 pm. Margaret Sullivan (Mags) of AustenBlog: A compendium of news about Jane Austen in popular culture, because (as she should be) …”She’s everywhere.” Mags’ unique wit and waggish voice will keep you laughing and shaking your head at the foibles of the news media, writers and movie makers who attempt to interpret Austen in their ‘own’ light. Her recent book, The Jane Austen Handbook: A Simple Yet Elegant Guide to Her World, received high praise within the industry and Austen community. Her other online accomplishments include web sites Mollands and Tilneys and Trap-doors. Mags will be writing about Sense & Sensibility, airing on two consecutive Sundays, March 30 & April 6, at 9:00 pm. I am sure that you will join me in congratulating each of these talented and devoted Janeites, visit their sites and blogs, and bookmark the PBS blog Remotely Connected to have your share of the conversation after each adaptation airs. (Post Script) Did you notice that each of the ladies personalities match the heroine of the novel/adaptation that they are writing about? Hah! I did. Present writer excluded since saying I was like Jane Austen would, – – like be so totally fer sure not true babe, – – as if!